A full size torso with interchangable organ. - Internal structures of the heart, and its relation with the large blood vessels. - Thus a clearer conception of the routes of the systemic and pulmonary circulation can be obtained. - Dissectible into 3 parts, 4 times enlarged. Made of PVC plastic. Jullundur (jalandhar) surgicals enterprises is one of the leading wholesaler offering a wide range of medical models and charts under its brand name je mediguard. please click on "more detailed information" to see the complete attached catalog. We are one of the noted manufacturers and suppliers of medical products like Human Kidney model (Item Code: M.E -02). 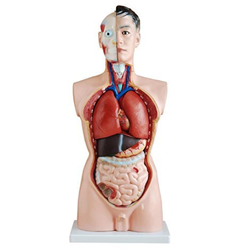 Fabricated from premium grade PVC and Fiber glass, our human organ structures are used in Medical research laboratories, Clinics and Medical colleges. Glass Agencies EROSE are manufacturer of Human Heart . Glass Agencies EROSE are manufacturer and exporter of all type of Ophthalmic and Optometric Instruments. · Female Pelvis with miniature skull. · Made of PVC plastic. A life-size model separated into 7 parts. The lungs have 2 removable lobes to show the internal structures. The heart bisects showing atria, ventricles and valves, the larynx bisects and the diaphragm is shown. Teeth of humans are small, calcified, hard, whitish structures found in the mouth. They function in mechanically breaking down items of food by cutting and crushing them in preparation for swallowing and digestion. The roots of teeth are embedded in the maxilla (upper jaw) or the mandible (lower jaw) and are covered by gums. Teeth are made of multiple tissues of varying density and hardness. Schematic representation of the nerve cells and axon with medullary sheath and schwann’s sheath. On base. 75 times life-size, detail structure of 3 layers of the hairly skin in different planes of section are shown. Human Skin Anatomical Model shows hair follicles with sebaceous, sweat glands, receptors, nerves and vessels. Human Skin Anatomical model mounted on a base. 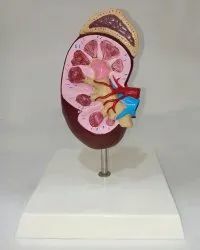 Set of three models on one board Kidney section, 3 times full size. Nephrons and blood vessels 120 times full size showing a section through renal cortex and medulla. an opened Malpighian corpuscle with glamerules and Bowman’s capsule. On base , with key card. Representation of an entire villus of one longitudinally sectioned villus to show arterioles and venules, and of one cut villus to show the lymphatic vessels. With enlarged representation of a longitudinal section of one crypt of Lieberkuehm.